Now, however much we both agree on this, my little one told me probably best not to say it mum. 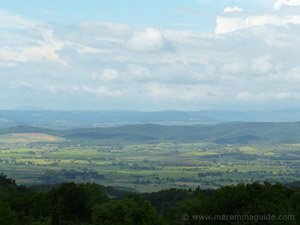 And, indeed, I have always tried to follow Thumpers's dad's advice and find something good to say about wherever my travels in Maremma have taken me. But, having finally made a special trip and driven a long way to arrive at a place that is probably the most well known in the whole of Maremma, I can only say that I was sorely disappointed. Bolgheri is boring. The place, not the wine that is. 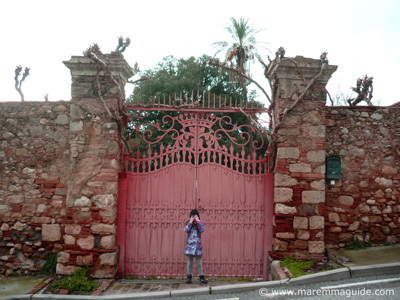 My daughter who willingly and happily explores every bit of Maremma with me, from woods to rock outcrops, to ruined castles and tiny hamlets without an "attraction" in sight, wanted to go straight back home because, "it isn't what I thought it would be mum". Let me explain. It isn't because there is nothing to do in Bolgheri. Indeed, there is more "to do" here in the sense of shops and wine tasting than in many other villages and towns in this part of Tuscany. Most of which, for some visitors, will be remembered - or likely as not quickly forgotten - as places where there was "nothing to do", because each is, simply, a place where people live with not a leaning tower - actually, there are towers that since the middle ages do now do lean a bit here and there... - or museum with the reputation of the Uffizzi, in sight. My disappointment stems from the fact that it is hard not to find a ground level door or entranceway that isn't a bar come restaurant come pizzeria, a tacky souvenir shop, Aqua di Bolgheri perfume shop, "gelato" (ice cream) or coffee shop, expensive Tuscan deco shop, bed and breakfast (camere) etc. The enoteca wine tasting shops I understand: Bolgheri wines are after all still the most famous of Maremma wines. It was the multitude of large plastic-coated menus in three languages dominating the pavements and along the roadside that finally did it for me. But the swamping of this tiny town, so that for all intents and purposes it now only caters to the tourist trade, has changed the essence completely of what would once have been a quiet and picturesque location. Don't visit off season like I did if you fancy a coffee! As, unlike those other Maremma villages I mentioned, not one place was open for one on the late February afternoon I did. On the other hand, if you didn't find San Gimignano during the day, with its streets similarly lined with souvenir shops, restaurants and bars overwhelming and less than the Tuscan experience you had hoped for, then don't be put off planning a trip here. Especially if you are keen to try the local wines. 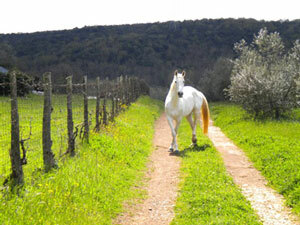 But if you aren't on a wine tour and have little time to visit Maremma, then please be aware that Bolgheri isn't typical. 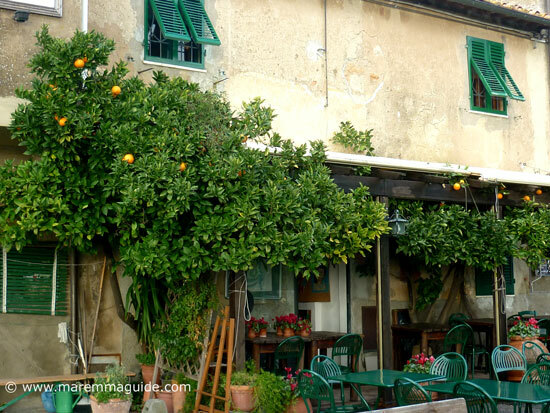 There are so many other tiny villages and towns in Maremma that will leave you speechless with their aged old beauty and medieval and Renaissance atmosphere that I wouldn't want you to miss them for a true taste of rural life here. And you won't find a single tourist outlet in one of them: fruit and vegetable shops, a butchers and a bakers, yes. 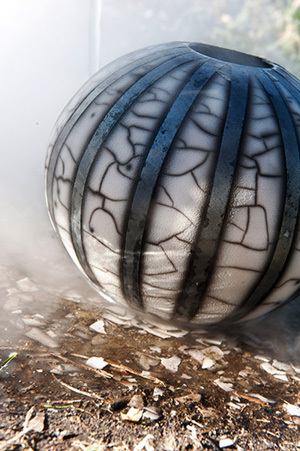 But mass produced ceramics or key fobs, no. 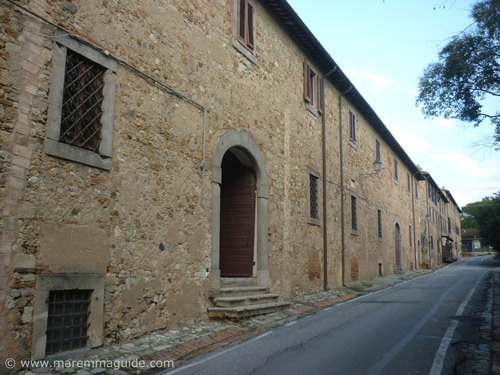 And then, the not to be missed drive along the wine route road from Bolgheri (take the turning half way down the cypress tree road) to Castagneto Carducci. For it was here that Bolgheri really impressed me. All the famous wineries are lined up one after the other, with their impressive aziende, podere, villas, and immaculately tended vineyards. Just like the bottles of their famous wines in every local enoteca and restaurant, label after label, winemaker after winemaker. All the while with the wooded hillside in the background and a tiny chapel that catches the eye. 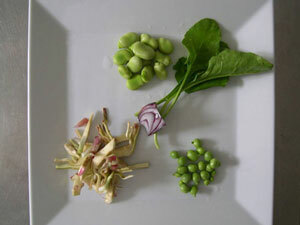 I'll be heading back in a couple of weeks time when the spring shoots are out on the vines to take some pics. Take a private guided winery tour - at the pace that suits you - down that wine route road, dipping into winery after selected winery with a guide who knows her stuff and the places to visit. Natascha. A multi-lingual qualified cultural and wine guide here in Maremma who tailors her half or full day tours to suit each individual client. No follow a crowd or an umbrella here! Drop her a message via this form to let her know what you would love to do. Or ask her for suggestions based on your group's mix of interests, and let her take care of the rest. 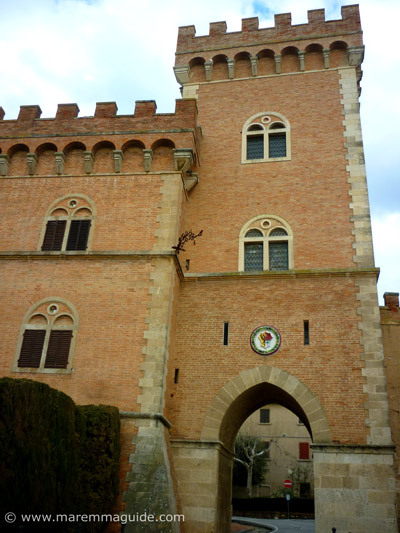 The first documentary records of the settlement of Bolgheri on one of the foothills of the "Monti della Gherardesca" east of the coastal plain in Maremma, refer to it as the locality of "Sala Ducia Allonis", property of Allone, a Longobardo Duke of Lucca and Pisa. 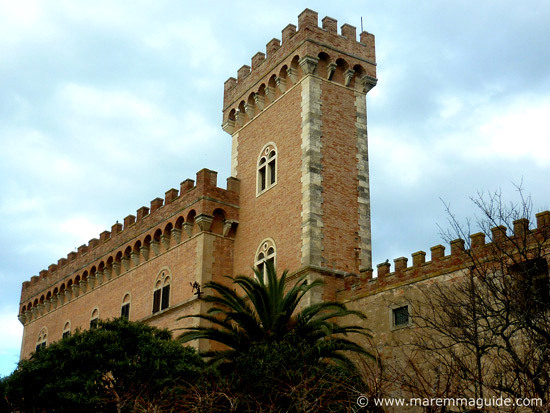 In an Act dated January 23, 1158, it was referred to as "Bolgheri" and its inhabitants included as the property of the owners of its castle, the dukes of the Gherardesca family. The same family that, despite having forged strong ties with the city of Pisa further north along the coast, by the end of the second half of the eleventh century had concentrated their holdings and consolidated their wealth at some distance away inland in the upper Maremma area. It was burned and sacked by the Florentines in 1393. And, as with the rest of the territories of Pisa in this area, then fell under the dominion of Florence in 1406. But this same change of rule also returned it to the control of the Dukes of Gherardesca: for they had since change city allegiance and were now Vicars of the Florentine Republic. The town and its castle suffered throughout the middle ages from various incursions and looting: its worst moment being in 1496 when, after a heroic defense, it succumb to Lanzichenecchi mercenaries, also known as Lanzi, hired by the Emperor Massimiliano d'Asburgo, an ally of the Republic of Pisa. Bolgheri was destroyed and rebuilt only in the first half of the sixteenth century. But it flourished again in the second half of the eighteenth century under the feud estate of the Gherardeschi, with the construction of some hilltop houses in the country and the beginnings of a statute of sharecropping. New infrastructure - a cellar, barn, mill, and olive oil press - and homes were built in the town. Much of what you will see today if you visit was constructed during that time. Then, in 1814, a terrible typhus epidemic reduced the population to a third. There are two designated out of town (very short walks away) pay and display car parks to cater for the seasonal visitors. 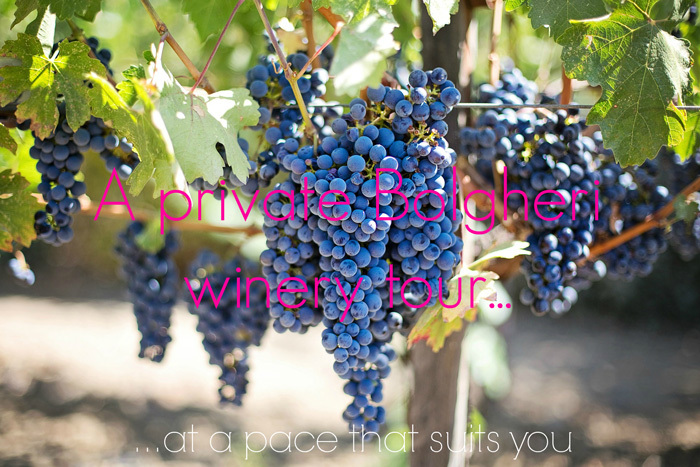 If you fancy tasting some Bolgheri wines, and who wouldn't, then this page will take you to every Bolgheri winery and vineyard, their wines, information as to whether they welcome visitors and how to book a wine tasting tour with them if they do. 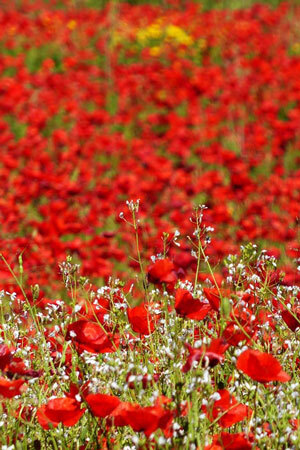 Or, if you'd prefer someone to take you on a wonderful guided tour, pop back up the page a little and contact Natascha. 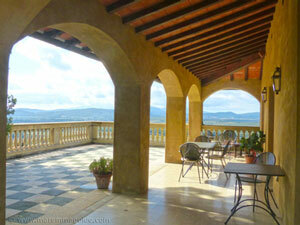 The best places to stay are nearby, rather than in Bolgheri itself. 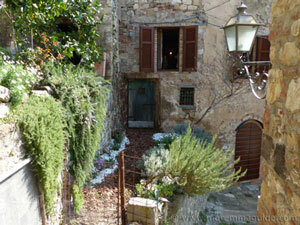 Try the superb Relais Sant'Elena bed and breakfast accommodation in Bibbona (just a few kilometres away). 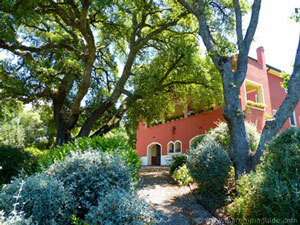 Or, the fabulous La Locanda di Villa Toscana guest house in an historic 19th century mansion.